The US Supreme Court has proven that it is not just. Proof is how they almost always vote down part lines. This underscores how flawed our justice system is in general. The US Supreme Court has become nothing more than a tool to force political policy of the prevailing majority of justices beliefs down the American people’s throats. The Supreme Court ruled on McCullen v. Coakley, striking down a Massachusetts law requiring protesters to stay at least 35 feet from an abortion clinic’s entrance and walkways. On June 30, 2014, in a 5-4 decision, the Court ruled that Hobby Lobby and certain other private corporations may now deny female employees insurance coverage for contraception by simply claiming it goes against their company’s religion. According to the all-male Supreme Court majority, Viagra gets covered. But if you’re trying to avoid getting pregnant–or have endometriosis and need a birth control prescription–you’re out of luck. Why? Because as Justice Anthony Kennedy literally said during arguments, birth control is “not that important”. Ninety-nine percent of women will use birth control at some point in their lives, 58 percent of them for a reason other than preventing pregnancy, like treating endometriosis. As a result of this ruling, women will suffer and be unable to afford the medication they need. Ultimately, this is about respect. Five men on the Supreme Court just ruled that women’s health care needs are not legitimate health care needs. The Supreme Court ruled that public workers can opt out of paying union dues. Recent decisions of the predominately Republican Supreme Court “Justices” are total BS. This is just another example of why ALL Republicans should be removed from office on every level of government. Video showing part of Anita Hill’s Senate testimony on 10/12/91 on the confirmation hearing of Clarence Thomas. His vote caused worst president ever, George W. Bush to be installed as President. 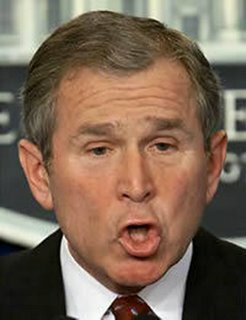 As a result of George W. Bush being president, the United States engaged in a unprovoked war against Iraq which resulted in the deaths of over 4,000 US deaths, over 32,000 US Troops wounded and over 100,000 Iraqi deaths. The George W. Bush administration also ran up a debt of almost 10 trillion dollars. George W. Bush also is responsible for 2 conservative Supreme Court appointments which caused the current dysfunctional Supreme Court. The travesty of George W. Bush being president will likely be felt for generations. Clarence Thomas’s vote caused a Key Provision Of Voting Rights Law to be struck down. Clarence Thomas cast the key fifth vote enabling corporations to spend unlimited money influencing U.S. elections. As a result of this vote, outside groups spent nearly $300 million influencing the 2010 elections — much of which would have been illegal before Justice Thomas green lighted this spending. Antonin Scalia was appointed by President Reagan in 1986. Scalia was 50 years old at the time. He is now 77. Antonin Scalia is one of the Supreme Court Judges responsible for installing “Worst President Ever” BUSH as President. Scalia was one of the “Justices” who voted for Citizens United (a 5-4 decision) which allows billionaires to funnel UNLIMITED amounts of cash to Super PAC’s which fund TV commercial supporting candidates who support their agendas, as long as they don’t directly coordinate with the candidate. Super PACs (Political Action Committees) are outside groups which raises money to support Political parties candidates. Justice Stephen Breyer who voted against Citizens United stated “There are real problems when people want to spend lots of money on a candidate … they’ll drown out the people who don’t have a lot of money”. Scalia’s solution for people who don’t like all the political advertisements unleashed by the court’s decision that ended limits on corporate contributions in political campaigns – “Change the channel or turn off the TV”. These videos shows how incompetent Antonin Scalia really is. Antonin Scalia – A Troll! Young Turks anchor Cenk Uygur destorys Scalia in this video and proves Scalia to be a complete idiot who makes his legal decisions, not based on the law, but on his own moral convictions. Justices of the Supreme Court should be allowed to serve for a maximum of 12 years. NO ONE should be guaranteed a job for life. US Supreme Court Chief Justice is paid $255,500 per year and associate justices are paid $244,400 a year. It is clear from the horrible decisions made by the Republican members of the US Supreme Court, they are not worth a fraction of what they are being paid. Their salaries is a waste of taxpayer money and another example of how hopelessly screwed up our government is.